Crazy Machines 2 Complete Including All Add-ons Released - Viva Media Releases Crazy Machines 2 Complete Including All Add-ons Ever Created for the Franchise - Introducing the Time Travel add-on pack. Turn back the clock in these zany levels with more amazing physics combined with 3D Rube Goldberg-style gameplay. Available today! Get ready to create the ultimate contraption when Viva Media’s Crazy Machines 2 Complete launches both online and in retail stores nationally. Gamers and adoring fans of the franchise will be able to enter a new dimension of fun as they continue solving challenging puzzles using the most ingenious means at their disposal. Playing the mind-bending expansion packs: Back to the Shop, Liquid Force, and the NEW Time Travel add on levels. Tinkering in the game’s sandbox means countless hours of creative fun with endless possibilities. You are limited only by your imagination. Carlo Voelker, CEO of Viva Media, commented, “For the first time, players will be able to have all the add-ons ever created for the game in one package. Core Gamers and puzzle fans will delight in this collection of crazy conundrums.” Players will be able to swap ideas with other players in the online community at crazymachinesgame.com and also post their contraptions and solutions on facebook.com. The North American (United States and Canada) retail version of Crazy Machines 2 Complete is now available! Crazy Machines 2 Complete brings together all the add-ons ever created for this wildly popular “Rube Goldberg-esque” style of puzzle gaming. Gamers will be treated to new, never before seen levels from the Time Travel add-on in the all new expansion levels. Players will be able to immerse themselves into a puzzle world where anything goes! Incredible physics game play combined with more elements and more levels than ever before deliver an unparalleled crazy gaming experience! Gravity as an option and utilizing the power of water to solve mind benders creates unique opportunities to enjoy the amazing physics built into the game. 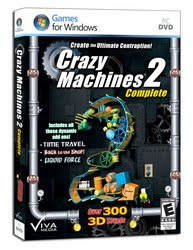 With more levels and elements than ever before, Crazy Machines 2 Complete offers an apogee of gaming fun! * Over 330 levels to solve with new parts, pieces and contraptions! VIVA MEDIA, founded in 1999, has grown to be a market leader maintaining a top 10 NPD ranking for the last several years. Viva Media products are found in most mass-market retail locations. The New York based company focuses on delivering quality and is dedicated to publishing a wide array of interactive content of the highest standards on a variety of platforms. Shop Crazy Machines 2 Complete for LE$$ / Price list Click here!